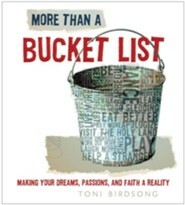 More Than A Bucket List: Making Your Dreams, Passions, And Faith A Reality by Toni Birdsong was a book I enjoyed. It was so easy to read that I read the whole book in one day! At times the book felt like it was written for super rich people with advice such as to visit Germany, Ireland, and Belgium. "Don't say yes when you mean no. Buy a blender and start making healthy smoothies. Spend your time on the real problems, not the imaginary ones. Determine to live an outrageously creative life. Learn to ask for help when you need it. Understand and overcome the fear of death. Find a mentor. Be a mentor. Surrender "that one thing" to God. Read the book Boundaries. Only keep healthy relationships. Right a wrong. Don't major in the minors. Let the small stuff go." There are some good ideas/advice. On the other hand, some advice/ideas seem pretty meaningless and worldly to me. "Eat a Dodger Dog at Dodger Stadium", "Attend a U2 concert", "Visit Graceland in Memphis. As you walk around, try for just 1 percent of Elvis's swagger", "See the Rose Bowl Parade in person", etc. Even though lots of the ideas are silly, it was a fun book to read. One of my favorite ideas is to make a reverse bucket list (listing things you have already done rather than what you haven't yet done) which I did. My advice? Take this book with a grain of salt. Know your own dreams and passions. By the grace of God, work as hard as you can to achieve them. And be thankful even if you never "take a surfing lesson" or "go horseback riding on the beach of an exotic island at sunset" or "fly first-class just once". Note: I received this book from Thomas Nelson/Booksneeze for free in exchange for my honest review. I enjoyed your thoughts on this. I am a home school graduate and book reviewer too!